SPECIAL INTEREST For REPA classes, register online at rentonwa.gov/cybersignup or call 425-430-6700 | 23 Intro to Amateur (HAM) Radio Ages 13–Adult. 17 and under must be accom- panied by a parent or guardian. Amateur radio, often called ham radio, is both a hobby and a service in which participants called "hams" use various types of radio equipment to communi- cate with other radio amateurs for recreation and public ser vice. This class will cover the basics of amateur radio, including technology, radio etiquette, emergency communications, and what to look for when purchasing a radio. You will also learn about the opportunities for putting your radio skills to good use! This class is designed for people who already have their ham radio technician license, but it is not a requirement. Held at Renton Fire Station 12, 1209 Kirkland Ave NE, Renton. 61515 Thur May 10 6:00–8:00pm FREE Disaster Glamping Ages 13–Adult. 17 and under must be accom- panied by a parent or guardian. Ready to take your glamping (glam camping) skills to the next level? Want your emergency kit to be the envy of the neighborhood? Do you know how to bake a delicious pie using bunsen burners? Join us as we model how to mix camping, comfor t, and preparedness with the latest gadgets, tips, and tricks you need to survive in style! Finish class with a slice of survival pie and an MRE to take home. Held at the Renton Community Center. 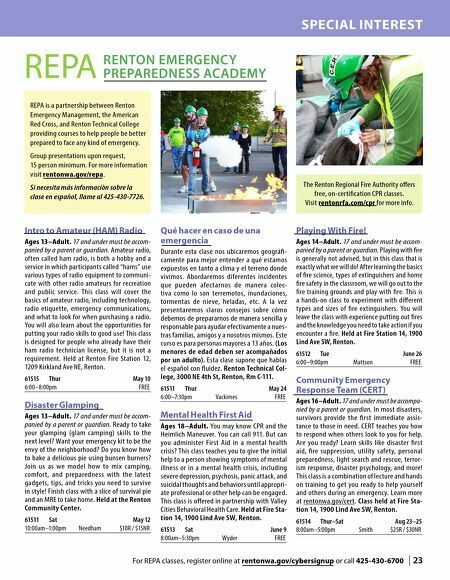 61511 Sat May 12 10:00am–1:00pm Needham $10R / $15NR REPA is a partnership between Renton Emergency Management, the American Red Cross, and Renton Technical College providing courses to help people be better prepared to face any kind of emergency. Group presentations upon request, 15 person minimum. For more information visit rentonwa.gov/repa. Si necesita más informaciòn sobre la clase en español, llame al 425-430-7726. Playing With Fire! Ages 14–Adult. 17 and under must be accom- panied by a parent or guardian. Playing with fire is generally not advised, but in this class that is exactly what we will do! After learning the basics of fire science, types of extinguishers and home fire safety in the classroom, we will go out to the fire training grounds and play with fire. This is a hands-on class to experiment with different types and sizes of fire extinguishers. You will leave the class with experience putting out fires and the knowledge you need to take action if you encounter a fire. Held at Fire Station 14, 1900 Lind Ave SW, Renton. 61512 Tue June 26 6:00–9:00pm Mattson FREE Community Emergency Response Team (CERT) Ages 16–Adult. 17 and under must be accompa- nied by a parent or guardian. In most disasters, survivors provide the first immediate assis- tance to those in need. CERT teaches you how to respond when others look to you for help. Are you ready? Learn skills like disaster first aid, fire suppression, utility safety, personal preparedness, light search and rescue, terror- ism response, disaster psychology, and more! This class is a combination of lecture and hands on training to get you ready to help yourself and others during an emergency. Learn more at rentonwa.gov/cert. Class held at Fire Sta- tion 14, 1900 Lind Ave SW, Renton. 61514 Thur–Sat Aug 23–25 8:00am–5:00pm Smith $25R / $30NR Qué hacer en caso de una emergencia Durante esta clase nos ubicaremos geográfi- camente para mejor entender a qué estamos expuestos en tanto a clima y el terreno donde vivimos. Abordaremos diferentes incidentes que pueden afec tarnos de manera colec- tiva como lo son terremotos, inundaciones, tormentas de nieve, heladas, etc. A la vez presentaremos claros consejos sobre cómo debemos de prepararnos de manera sencilla y responsable para ayudar efectivamente a nues- tras familias, amigos y a nosotros mismos. Este curso es para personas mayores a 13 años. (Los menores de edad deben ser acompañados por un adulto). Esta clase supone que hablas el español con fluidez. Renton Technical Col- lege, 3000 NE 4th St, Renton, Rm C-111. 61511 Thur May 24 6:00–7:30pm Vackimes FREE Mental Health First Aid Ages 18–Adult. You may know CPR and the Heimlich Maneuver. You can call 911. But can you administer First Aid in a mental health crisis? This class teaches you to give the initial help to a person showing symptoms of mental illness or in a mental health crisis, including severe depression, psychosis, panic attack, and suicidal thoughts and behaviors until appropri- ate professional or other help can be engaged. This class is offered in partnership with Valley Cities Behavioral Health Care. Held at Fire Sta- tion 14, 1900 Lind Ave SW, Renton. 61513 Sat June 9 8:00am–5:30pm Wyder FREE RENTON EMERGENCY PREPAREDNESS ACADEMY The Renton Regional Fire Authority offers free, on-certification CPR classes. 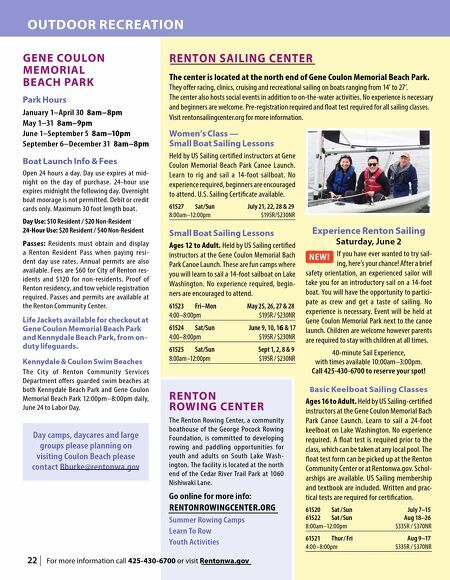 Visit rentonrfa.com/cpr for more info.